Last week was a week of surprises. The Daily Star (close to March 14) told us that Jumblatt has sent a Letter to Bashar Al-Assad. Jumblatt denied it violently on Tuesday, and attacked The Daily Star by comparing it to Al-Akhbar (close to March 8). Al-Akhbar struck back at Jumblatt by confirming the Daily Star story and indirectly siding with the other newspaper. Regardless if Jumblatt sent a letter to Al-Assad (asking him to re-enroll two Druze defected officers in the Syrian Army) or not, Jumblatt’s reaction to the news carries several messages. 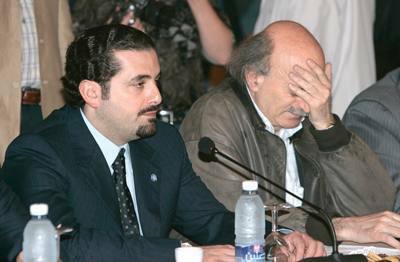 Jumblatt was criticized by newspapers close to the two coalitions and chose not to stay silent. As I have noted earlier in summer, the FPM and the FM are getting closer and closer. Ahead of the May 2014 elections, Michel Aoun had started since June a (very) slow but steady change in his stances. New rivalries, such as the one with Sleiman Frangieh are seeing light. His weekly criticisms of the Future Movement, Fouad Siniora and Saad Hariri are now exceptions. Instead, his new targets seem to be Berri, Jumblatt, and to some extent Hezbollah. Yes. Hezbollah. A couple of months ago, the FPM criticized Hezbollah for setting up/repairing a telecom network near the city of Zahle. In 2006, when Basmet Watan impersonated Nasrallah in the satirical show, Charbel Khalil, the director of the show – known for his close ties with the Free Patriotic Movement – apologized for his sketch. Last week, Charbel Khalil impersonated Hassan Nasrallah for the first time since 2006. While the timing of the criticism is to be noted, the most important thing about the sketch is that Charbel Khalil will not apologize this time. Last week, while everyone was talking about Jumblatt’s letter, something very important went unnoticed: The FPM and the FM were having their first meeting since 2005. That’s not even a major progress. That’s a huge one. And why is it huge? Because apparently the Saudis are pressuring the M14 parties to halt their negotiations with M8 parties in the light of better American-Iranian relations. So for the Aounists and Harirists to meet in such a hostile context is a strong indicator that perhaps after all, there can be an agreement between the two political foes. Any agreement between Future Movement and the Free Patriotic Movement is bad for all the other parties. Nabih Berri might never become speaker again. The Lebanese Forces and the Phalanges would be even more marginalized in the M14 coalition. Mikati would lose it all. M14 would control the majority of the MPs, leaving M8 with less than 30% of the seats in the parliament. M8 wouldn’t be able to constitutionally block the presidential elections by lack of quorum, while the major Christians parties, united under the banner of March 14, would choose their president without questions of his legitimacy. After all, he has the backing of practically all the Christians and half of the Muslims. Hariri might become Prime Minister again – and who knows, under the presidency of a Aounist president? As stated above, the FPM and the FM are together invincible. Maybe after a decade of rivalry, the FPM and the FM are starting to understand that the two parties were meant to rule together. But the scenario above is highly unlikely today and in the near future. Hezbollah, Nabih Berri and the Lebanese Forces would be panicking if they would even feel that such an alliance is even in its embryo form. We do not see panic. Instead we see a bit of denial from Walid Jumblatt who is strengthening his ties with M8 by supporting the 9-9-6 governmental formation, attacking one of M14’s newspapers (after being its traget), and sending a letter to Bashar Al-Assad (?). Let’s face it, if The Daily Star is criticizing him (regardless if the letter is a rumor or not), things are not well between the FM and the PSP. The truth is, Walid Jumblatt is a minor political player. He has a relatively small bloc. His glory resides in the fact that he’s in the middle while M8 and M14 have roughly equal parliamentary sizes (no one can seize power alone). If any of the above conditions change, Jumblatt has to adapt so he can still be kingmaker. While there is still hostility between the FPM and the FM – Abdel Mounem Youssef and Nicolas Sehnaoui attacked each other in the same week the meeting happened – things are very (again, very) slowly starting to change. Jumblatt is sending a clear message to Hariri: He is willing to sacrifice his position in the middle in favor of M8 if he will one day be abandoned by a FPM/FM memorandum of understanding destroying what’s left of his influence. The closer the FPM and FM ties will be, the more Jumblatt will have to ally himself to the other M8 parties, so that he can still be – to some extent – the man controlling everything in the middle. With Aoun in the middle (to maximize his chances for the presidential elections), the Jumblatist centrist influence will be useless and Jumblatt can only try to counter this Aounist maneuver by nullifying Aoun’s new role and siding with one of the two blocs. When Aoun will side with M8, expect Jumblatt to support M14. When the FPM will start negotiations with the FM , expect Jumblatt to side with M8 (What happened last week). You might not notice it, but there’s a struggle from Jumblatt to keep the status quo. He is fighting some kind of political war so he can stay the only one in the middle and keep the size of both sides intact at the same time. Jumblatt only remains Kingmaker by making sure that there is at no time a decisive majority in the parliament without his 7 votes. If he feels there’s a bloc (M8 or M14) getting bigger because someone from the other side is “defecting”, he’ll quickly create another majority by joining one of the two blocs before the party from the other side finishes the “defection”. The coalition will thus be in no need of the other party now that Jumblatt is on its side and the parliamentary majority is secured. After successfully aborting the political migration of a party to the other coalition, Jumblatt slowly distances himself from the new majority making it weaker and highly depending on him. That’s how he makes sure that his role of kingmaker is still intact and he is as powerful as the largest bloc in the parliament. Variants of this scenario happened in 2009 when Jumblatt became a centrist, in 2011 when he picked a side, in 2013 when he picked the other side, and in a less apparent way, last week. And the Jumblattist strategy is actually working: If I’m not mistaken, the PSP is the only party that participated (without resigning) in all the governments, with the same share, since 2005. Aoun decides to distance himself a bit from M8 and strengthen his ties with the FM so he can maximize his chances for the presidential elections in May. The FM falls into the trap (Perhaps Aoun didn’t do it on purpose, but it worked): Jumblatt has no choice but to side with M8 so that he can counter anything that might happen. But theoretically Aoun is still with M8 (the transition is slow). M8 hence gets Jumblatt’s support (and the definite support for the 9-9-6 governmental formula?). M8 wins the round (unintentionally). For now.